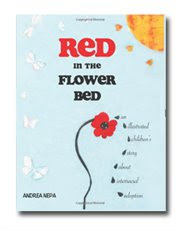 Andrea Napa is the author of the new adoption-themed children's book, Red in the Flower Bed. Andrea is the mother of an adopted Vietnamese daughter named Leah. She is a registered dietitian at the Children's Hospital of Philadelphia. Red in the Flower Bed is for recommended for readers ages 6-8. This interview was conducted over email in June 2009. Thank you for sharing, Andrea! 1. When and why did you begin writing Red in the Flower Bed? When my daughter was 4 months old we brought her home from Vietnam. She understood from an early age that she was adopted, and sometimes would cry that she missed her birth mother. She would also ask questions that we didn't have the answer to, as we were not given any info. as to who her birth parents were or why she was given up. Her saddness and my inability to answer her questions was inspiration for writing this story. I started writing it when she was about 3 or 4, and from time to time I would work on it. The story just wouldn't leave me. Then just when she turned 5 years old she was diagnosed with Ewings sarcoma, a rare form of childhood bone cancer. (After major surgery and 8 months of chemotherapy she has now been in remission for 2 years). The concept of the seed's journey took on even more significance, as it seemed that she had already journeyed very far (both literally and figuratively) for a little girl. She was taken from her birth place half way around the world as an infant and then fought cancer a few years later. Furthermore, I couldn't help wondering if she had "landed" in the right place, as we live only 20 minutes away from the best children's hospital in the country, if not the world. I also happened to work there. It seemed more than coincidence that she ended up with us. 2. In Red in the Flower Bed, the poppy seed flower is beautiful but does not look like the other flowers in the family garden. Although it is not mentioned in the text directly, this story is an illustration of interracial adoption. How old is your daughter now and how does she react when you read your book to her? I deliberately did not use the word adoption in the story so that the reader can interpret the book in their own way at their own pace according to their age level. My daughter is now 7 1/2 years old. She loves the idea that I wrote a book and asked me to read it to her second grade class and is hoping that I will end up on TV! Her favorite page is the last page with the rainbow. I think she interprets this to mean that she is wanted and needed in our family, even though she does not look like us and is not a birth child like most of her friends. She also seems to be comforted by the mother poppy being sad, as it helps her feel that she wasn't just thrown away by her birth mother. Also, I made the seed turn into a red poppy flower like its birth flower, since when my daughter asks what her birth mom looks like I can say with some confidence "she looks like you", which she loves to hear. She is proud of her Vietnamese background and always answers that she is from Vietnam whenever someone asks where she is from (even if they just mean what state). I hope that she will never feel ashamed of looking different from her family or classmates. In this story the seed retains its identity no matter where it lands since its heritage can't be ignored or denied. Note that the garden flowers accepted the seed for who she was even before they knew what kind of flower she would be. The seed blossomed into her full potential because she was given the care and love she needed. 3. What are some good questions / statements an adopting parent might add to this story to further relate to their child? Questions to prompt the child to think about the story could include: Why do you think this story is called Red in the Flower Bed? Even though the poppy did not look like the other flowers in the garden, was she still part of its family? Who did she look like? What did the seed need to grow in the garden? Do all flowers need this? How was the garden changed by the poppy flower? 4. Can you explain the choices made in the illustration technique? My main goal was to attract the attention of young children with colorful, eye-pleasing pictures. In children's books it's important for the pictures to bring the words to life. I was inspired by the art techniques of Eric Carle and Lois Ehlert, two of my favorite children's book illustrators. One adult reader commented that the collage style using different prints makes that point that "we are all one and can come together to form a single family". 5. Do you have anything specific that you want to say to your readers? I think that it's important to accept your child unconditionally for who they are, and to acknowledge your child's place of birth and heritage. It will always be a part of them. It is also important to respect your child's desire to know their background. It is their right to know. Allow them to talk about it and ask questions, even if you don't know the answer. Be honest.